Ants are one of a beekeeper’s most common pests, both in the apiary and in the honey house. Florida and the southeastern United States have a large and diverse ant fauna, with both native and exotic species. The vast majority of ant species have no impact on our bees or us. 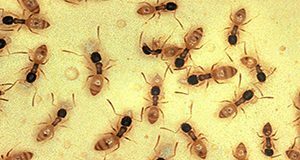 This 8-page fact sheet written by William H. Kern and published by the UF/IFAS Department of Entomology and Nematology describes the few pest species can cause serious problems and suggests ways to control the ants for healthier hives.